Drive Map Pro is a great piece of Windows software for organising all the servers you connect to. It’s primary purpose is to give you easy access to mapping a network drive with the minimum of fuss, however it does a lot more that that, including managing your VNC/Radmin connections too! Mapping network drives in Windows can be a real pain when you use lots of servers. You could leave your drives mapped to save time, but this slows down your PC as it polls all the connections to see if they’re alive. You could use batch scripts to map groups of drives but that’s pretty inflexible. DriveMapPro has been written to organize all your servers all through a single interface which sits unobtrusively in your system tray. Simply add the details of the servers you’d like to map a drive to, and then use DriveMapPRO to manage them. Mapping UNC network drives is one area of the functionality, it’s also great for organising your VNC connections, or any network-related application for that matter! User definable application launch (e.g. fire up VNC).. this means DriveMapPRO can act as a manager for your VNC / Radmin connections! Here are some screen shots which highlight some of DriveMapPRO’s features! There are a number of themes available, and creating your own is also very easy! You can configure whatever application you’d like to execute on a per-server basis. For example, to remote control the server you could use VNC, e.g. “c:\vncviewer.exe” $IP -shared ($IP will be replaced by the IP address of the server you’ve selected). Ability to have multiple drive mappings under one entry, syntax is ‘\\server\c$,d$,whatever’, which gives you the ability to map to any/all 3 of those drives without clogging up your list of servers! Middle-click launches the application you’ve associated with the server.. saves a click or two! Coming soon: set up multiple applications to launch against each server you’ve defined. This will let you fire up network tools – or whatever you like – in a couple of clicks! If you’ve registered DriveMapPRO, simply email me with your registration name & I’ll send you the latest install kit. In the unregistered version you’re limited to 8 entries. And remember that you can get the latest and greatest version of DriveMapPro by contacting me directly via email. When you activate the application you’ll be able to configure as many drives as you’d like. DriveMapPRO is a measly $20 USD for home use, and $40 for business use (payable via PayPal which accepts credit cards). As well as feeling good for buying a legitimate piece of software, you’ll be entitled to future updates free of charge! Simply hit one of the methods below, make the payment, and you will normally receive your personal registration code within 24 hours. Important: If you want the software registering to a name other than the one appearing on your PayPal account, or want the code delivered to a different email address, then please get in touch and let me know. It could be that you don’t have the VB6 runtimes installed on your PC.. XP has them loaded on as default, but you may need to download them if you’re on an older operating system. You can get them from Microsoft here. When you’re viewing the list of servers you can hover over each entry to reveal the default drive mapping and any stored notes, e.g. Only 1 application can be defined per server, but in version 1.6 and above you can have 10 which appear for all the servers you’ve set up in Drive Map Pro. This is broken down at runtime to give you 3 network drives to map to on the popup menu. Double-clicking on the server will map to the first drive. 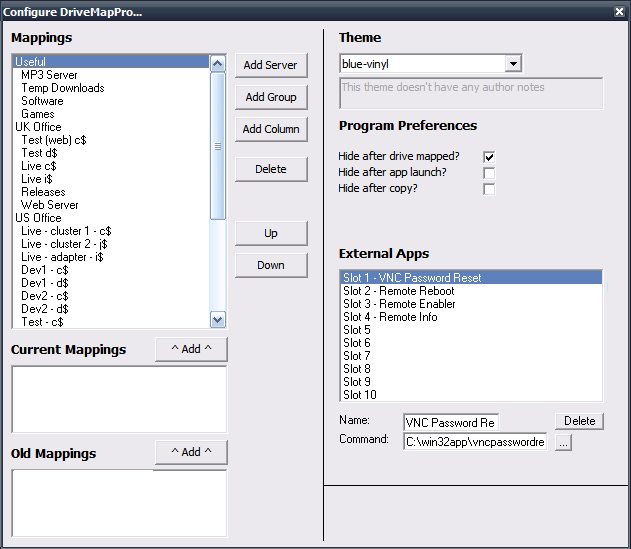 Take a look in the DriveMapPRO installation folder. In there you’ll find a folder called ‘skins’. Copy one of the existing .ini files (I’d recommend copying the one called blue-vinyl.ini). Take an image and resize/crop it to something like 640×480. Then edit the .ini file you copied & change the second line ‘background-image=’ to point it at your image. That’s it.. open up the DriveMapPRO configuration screen and it’ll pick up the new .ini file. You can preview what it looks like by selecting it in the drop-down list. The font size, colour, and face are all customisable. Jump into the .ini file and you can change them to suit your theme.